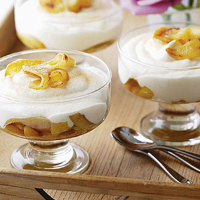 Buttery apple and cinnamon is topped with a creamy, syllabub in this stunning dessert. In a small bowl, mix together the apple juice, sugar, 2 large pinches of the ground cinnamon, and the lemon juice. Cover, and place in the fridge until needed. Cut each apple quarter lengthways into thin slices. Melt the butter in a large frying pan. Now add the apple slices, scatter with the remaining cinnamon and fry for about 2 minutes on each side until golden (in batches if necessary). Remove from the heat and place to one side to cool. To make the syllabub, place the cream in a large bowl and use an electric whisk to gradually beat in the chilled apple juice mixture. Continue to whisk until the mixture holds its shape in soft peaks. Reserve a few apple slices to use as a garnish. Divide the rest of the apple between 6 serving glasses and top with the syllabub. Decorate with the extra apple slices. Chill in the fridge if not serving immediately. Try serving the syllabub with Waitrose Organic Shortbread Fingers. Eat the dessert within 24 hours of making. A glass of Elderflower Refresher, made with hand-picked flowers, is a good match for this dessert – and a good alternative to alcohol.